It may look like the summer of 2015, but in this review we have actually leaped ahead to 2016 and we're driving Hyundai's compact Elantra GT. Who knew that in the waning weeks of 2015, scientists would release genetically-reengineered dinosaurs to the wilds of central Connecticut? But that's the future for you. Or it may be, we'll just have to wait and see. But one thing I do know for sure is the 2016 Elantra GT is here now, and it's a very interesting player in the compact class. Like pretty much every new car that comes along, the GT flirts with the size class above it, as it's nearly roomy enough to be called a midsize. But perhaps even more desirable than generous interior room is the fact that, with a couple of option packages, the Elantra GT has all the comforts of cars costing considerably more. It also delivers impressive fuel economy, and excellent versatility thanks to its five-door hatchback design. Riding on a wheelbase of 104.3 inches (a couple of inches shorter than the Elantra sedan), the front-drive Elantra GT is powered by a 2-liter NU Inline Four. NU is an engine family designation, and does not mean it's entirely "new," although this is a tweaked version of a very contemporary design. Armed with Gasoline Direct Injection and the latest technology, the engine produces 173 horsepower. Two transmissions are available, a 6-Speed Manual and a 6-Speed Shiftronic automatic gearbox. We tested the latter, and while the 2-liter Four isn't the most refined out there, it's a great fit for this car and offers up good acceleration and outstanding fuel economy. The GT comes with a Sport Suspension as part of the Style Package that helps sharpen chassis response, and this is bolstered by what is now standard Hyundai fare: user-selectable electronic steering assist. This includes Normal, Sport and Comfort settings to help fine-tune feel. The Elantra GT is no cutting-edge sportster, but it is fun to drive, and feels light on its feet in congested traffic. A good part of this agility is the car's low curb weight, thanks to extensive use of lighter, high-strength steel. The firmer suspension rates don't damage ride quality, and road noise is kept reasonably stifled. The Elantra GT interior is blissfully free of excessive bells and whistles, while incorporating the latest in Hyundai's Blue Link Telemetrics. The Tech Package includes leather upholstery (heated and ventilated up front for year-round comfort), and there's also a navigation system, rearview camera and a huge panoramic sunroof that makes the car feel even more spacious. Rear seat room is generous and the rear cargo area has 23 cubic feet of space that increases to 51 with the rear seatbacks folded. All in all, this is a standout car in a very competitive class. 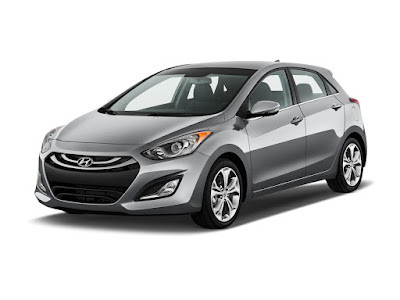 The 2016 Hyundai Elantra GT is EPA rated 24 MPG city/33 city and has a base price of $19, 800. With option packages, our GT had an MSRP of $26,675.